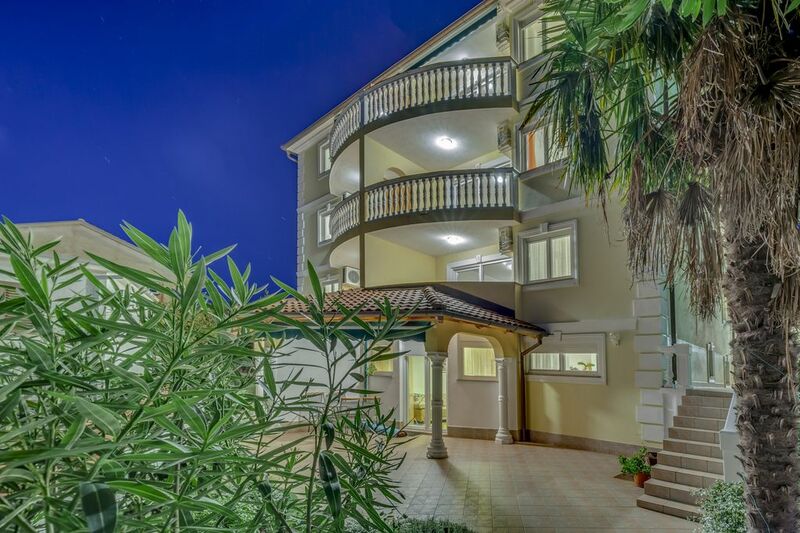 This apartment is located in the most famous part of Crikvenica - Crni molo. It is only 60 meters from the pebble beach and 150 meters from the sandy beach. The exclusive features and the perfect location promise a breathtaking holiday will remain in the memory. A small shop is located opposite the villa where you will find everything for your daily use. In addition, is still a cafe / restaurant. If you run along the promenade you will find of course a variety of restaurants, coffee bars, souvenir shops, bakeries and shops. The apartment is on the second OG. It is 55 m "in size, has 2 bedrooms (one with double bed and the other with two single beds as can easily make together), bathroom, living room, kitchen, terrace and a hallway with cloakroom. The bedrooms are separated from the living room and hallway separated by doors, noise prevention and privacy. In the living room there is a sofa bed. The apartment is for a maximum of 6 people. Air conditioning, satellite TV, washing machine, hair dryer, microwave, kitchen, cutlery and crockery, kettle, fridge, Internet via WLAN is available free of charge. The bedding is cleaned and disinfected. On the property there is 1 parking space. An electric grill can be seen on request for a fee of 15 euros per week on site to book (voluntary, not mandatory). Die Fewo war sehr sauber und gepflegt, hochwertig ausgestattet, noch schöner als es im Internet zu sehen ist. Mit dem Empfang hat alles reibungslos geklappt. Der ausreichend große Balkon bietet beidseitig eine herrliche Sicht aufs Meer und auf die Insel Krk. Zu verschiedenen schönen Stränden sind es nur wenige Schritte zu Fuß. Alles in allem ist diese Fewo optimal gelegen, es befinden sich zahlreiche schöne Restaurents und auch Einkaufsmöglichkeiten in unmittelbarer Nähe. Auch für Ausflüge oder Wanderungen ist die Fewo ein idealer Ausgangspunkt. Wir hatten einen angenehmen Aufenthalt bei wunderschönem Wetter. Wir können diese Fewo nur weiterempfehlen und werden auch wiederkommen.